Power washing requires expert use of the equipment. Power washing the exterior surface of your home or business does more than improve the curb appeal. Well maintained surfaces, free of pollutants, contaminants, and debris may last for full life cycle. Well maintained surfaces reduces the frequency of replacement of the surface materials. Fresh, clean, well-maintained surfaces draw positive attention to your home. A fresh power wash refreshes your outdoor spaces and highlights the value of your property. Siding, roofs, shakes, brick, pavers, concrete, vinyl siding, cedar siding, composite siding, and more! Areas like porches, decks, docks, stairs, children’s play equipment, fences, driveways, garages, sheds, car ports, pergolas, and gazebos can be power washed to great benefit. Power washing, with the right use of the tool and the correct cleaning product, removes dirty, hazardous contaminants. Contaminants land on outdoor surfaces through air pollution, car exhaust, polluted rain, long winters, roof run-off, gutter run-off and barbecues. Power washing reduces health-impacting allergens like mold and mildew. For the a high quality result the equipment has to be used properly, adjusted for various surface materials, and prepared according to the proximity of the cleaning area to other surfaces. There are many considerations such as the proximity of plant materials, run of areas, adjoining surfaces, wind conditions. A professional power washer knows exactly how to match the equipment to the tool for outstanding results. Your residential property or your business property is a long-term investment. Preserving the useful life of exterior surface materials, by regular professional power washing, yields a high return on your investment. Maintaining curb appeal always stabilizes property value. A fresh, clean, well-maintained business is always noticed by customers. When surveyed, return customers always remark about how “clean” a business was. To schedule an estimate, call 301-363-1600. The Blue Sky Painting & Carpentry team provides expert power washing for your business or home. 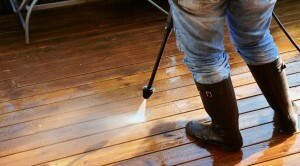 Power Washing a deck renews the surface.